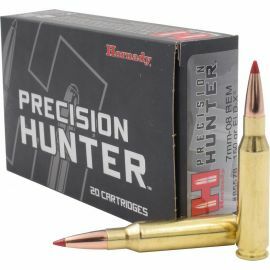 Hornady's new line of Precision Hunter ammunition is designed to deliver accuracy and consistency like never before. Built specifically to be a line of hunting ammunition Precision Hunter will astonish you with Match Grade like accuracy with superior ballistic performance. The ELD-X bullet is allowed to achieve its maximum ballistic potential and the propellants used in the precision hunter are clean burning with minimal run out. Powder and primers are carefully selected to provide you with the most consistent shot to shot results.